Last month we ran a brief post introducing Spellr.us, a service that monitors websites for spelling errors. Little was known about the site at the time – all we had to go by was a teaser splash page. The site has finally entered a private beta, and it shows a lot of potential. For those looking to try it out for themselves, you can grab one of 150 invites here. 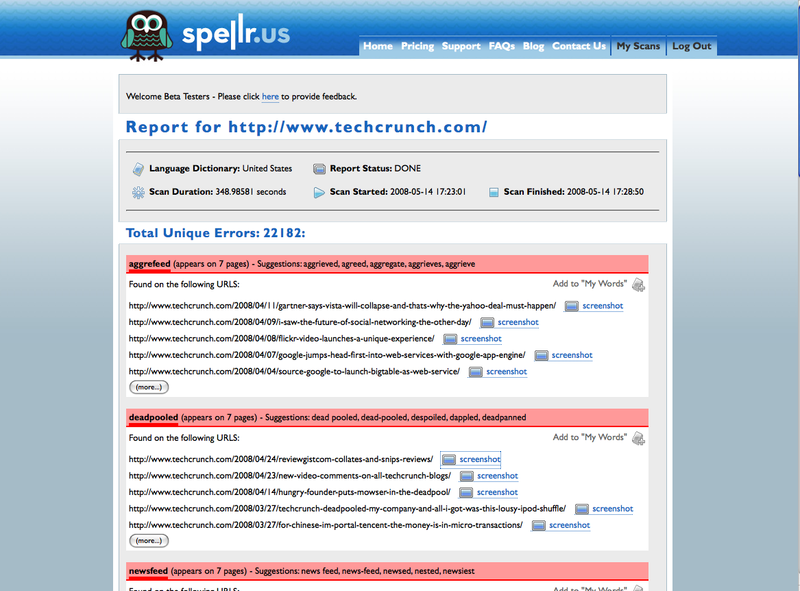 Spellr.us monitors webpages by running site-wide spell checks at regular intervals. Results are presented as snapshots of pages, with errors highlighted in bright boxes (a mouse-over displays suggested corrections). Members can also choose to have errors sent to them in RSS feeds – a feature that will be especially handy for large sites that make frequent posts. Besides the visual snapshots, Spellr.us can list misspelled words according to their frequency across the site. This means that words like TechCrunch or Flickr, which are commonly used but aren’t in the dictionary (yet), can be quickly found and added to a custom dictionary. I ran TechCrunch.com through a trial run, and the results were promising. Error flagging worked very well, with different colors to distinguish between possible errors and obvious typos. And the site’s main dashboard, which links to each error, made navigating across hundreds of pages surprisingly painless. Unfortunately the site is still very much a beta, so we won’t be implementing the service any time soon. Custom dictionaries don’t work yet, and the system doesn’t offer any way to omit user comments from the search (we wound up with over 20,000 flagged errors because of this, though we made a few mistakes ourselves…). Spellr.us says that all of these features will be introduced by the general release. Grammar checking is also on the horizon, though a concrete date hasn’t been established. Other players in this space include web tool supplier NetMechanic and TextTrust, which uses a combination of human and automated spellcheckers.